The PV Analyzer is designed to work as hard as you do. High measurement throughput means it can measure 1 MW in less than 2 hours--even in hot environments where other curve tracers shut down. 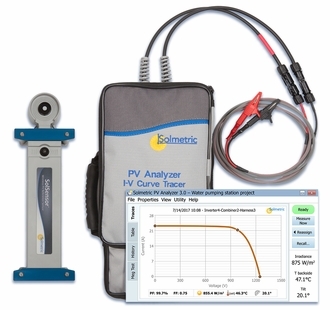 In an example PV system with 1300V Voc, 16 strings per combiner box, and 5 minutes to move to next combiner box, the PVA can make more than 800 measurements at 25�C ambient and 250 measurements at 45�C ambient. The incident angle corrected SolSensor is able to make accurate irradiance readings in lower light conditions extending your working window. 30A Measurement Capability (included): Measure up to 30A strings. This can be useful for measuring many strings in parallel, for example when harnessing before the combiner box is employed. High thermal capacity: >800 measurements at 25�C ambient, 250 measurements at 45�C ambient, in example PV system with 1300V Voc, 16 strings per combiner box, and 5 minutes to move to next combiner box. Please note: PVA-1500 shipments within the US currently have a lead time of approximately 3-4 weeks. Shipments outside of the US will begin in October 2018. For more information call us at 1-877-263-5026 or email us at info@solmetric.com.